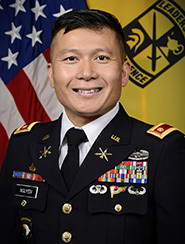 Major William Nguyen has been appointed chair and professor of military science at Clarkson University. Major Nguyen's service includes four deployments in support of Operations Iraqi Freedom and Enduring Freedom during which his platoon defended "Route Irish"—the most dangerous road in Iraq. He has served as executive officer for the headquarters and headquarters company of the 1st Brigade Combat Team, 4th Infantry Division in Northern Baghdad where he was responsible for training the Iraqi Army. He also worked with various intergovernmental organizations and non-governmental organizations to help the Government of the Zhari District, Afghanistan, establish governance and rules of law. After his final Iraq deployment, he was an army instructor, doctrine writer, and battalion executive officer for 1-40th Field Artillery, a brigades operations officer for the 434th Field Artillery and a senior air defense observer controller at the Joint Readiness Training Center. His awards and decorations include the Bronze Star Medal, Meritorious Service Medal, Army Commendation, Army Achievement, and Military Service Outstanding Volunteer Service Medals. He also earned the Combat Action, Parachutist, Air Assault, and the Pathfinder Badges.